Level-5's smash hit Inazuma Eleven is finally being translated for non-Japanese speaking audiences. One of Professor Layton and Dragon Quest IX studio Level-5's most unique titles is Nintendo DS soccer RPG Inazuma Eleven, and the main reason you may not have heard of it before is because the series has never made it outside of Japan. However, according to leaked information, Inazuma Eleven has finally been translated for other regions, and could release in Europe at the end of January. The leak has strangely been accompanied by screenshots already in English, but nothing official appears to have been confirmed yet. Bergsala, the distributor of Nintendo products in Sweden, Finland, and Denmark, tweeted today that Inazuma Eleven will be released in Sweden on January 28, 2011. It seems odd to release a game only in Sweden, so Inazuma Eleven could be coming to all of Europe early next year. There has been no mention of an additional North American release, but Nintendo of Europe hasn't even announced the game yet, so anything's possible. Sadly, soccer is much more popular in Europe than North America, so there's always the possibility that Europe will be the only lucky ones here. Inazuma Eleven is a significant title because it's an RPG, but it revolves around playing soccer instead of battling goblins or bandits. The game's characters still have statistics, such as "kick" and "control," and are also assigned elements, believe it or not. Players strategize their characters' movements on the field just like a real-time strategy game (see here), sometimes performing special moves such as the creation of a giant hand to stop the ball. 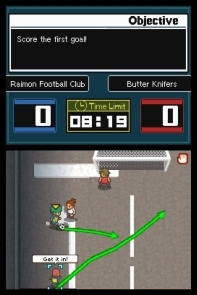 Outside of the soccer "battles," the game plays out just like other RPGs, with players walking around, collecting items/equipment, and talking to NPCs. Inazuma Eleven may have only come out two years ago, but it was still one of those titles that many non-Japanese RPG fans had accepted they'd never see. This may no longer be the case, but we'll have to wait for official information to find out for sure.